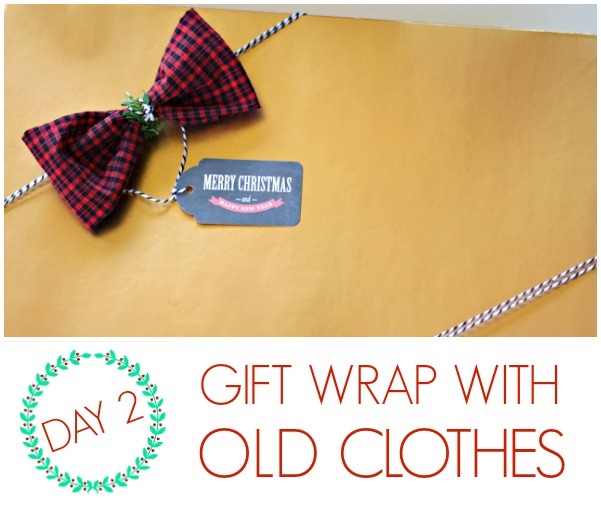 Wrap it Up #4: DIY Gift wrap ideas with old clothes - C.R.A.F.T. It’s the 2nd day of the Wrap It Up series! Did you see the dish towel gift wrap, DIY fabric stamped gift wrap, and wrapping with a pillow case ideas? We’ve got bazillions of DIY gift wrap ideas for ya with this series!This afternoon, we’ve got Carmel who claims she doesn’t like wrapping gifts! Either way, she’s good at it! Hi C.R.A.F.T. -ers! I’m Carmel from Our Fifth House (we’ve moved a lot and I’m clearly a blog-naming genius). When Jamie invited me to join in the wrapping fun I almost declined. The truth is – I really don’t like wrapping presents. I know right? As a diy blogger am I even allowed to say that?! It’s true though. 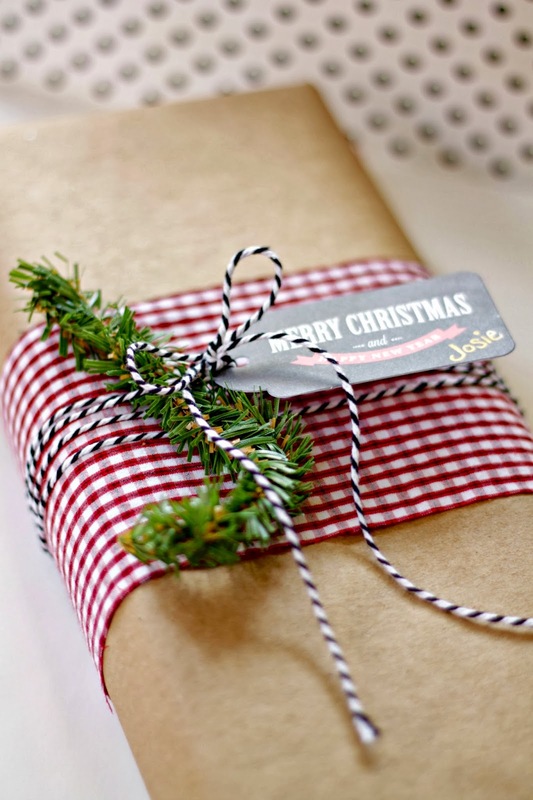 I love Christmas – and I love decorating – and I love buying or hand making something special for my loved ones, but I don’t like the present wrapping. Just when I was about to respond to her invite with an – “I’m sorry Jamie, but” – I had a light bulb moment. Maybe I’m not alone. Maybe, just maybe there are other people out there that don’t like the present wrapping part of Christmas too. 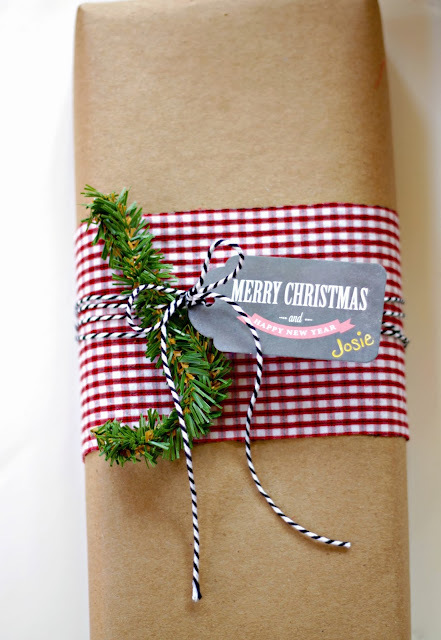 So this post is dedicated to you – you that would pretty much rather do any thing but wrap presents. I’ve got you covered. You can make your presents look pretty with little effort, not much time and practically no money! Woot! I either raid my kids closets in search of old worn out items that no longer fit or I hit up the men’s clothing department at Goodwill (the men’s department is typically flooded with good Christmas-y looking items). It’s a whole lot less expensive than going to the fabric store and it gives your presents the appearance of – wow, what a lovely package – instead of – she just threw this together in 2 seconds (which is actually what I did). Win-win! I’m a big fan of plain brown paper. I bought a roll at the hardware store years ago, and I don’t think I’ll be done with it until 2025. As you can see my basic approach is – brown paper – then layer a fabric scrap over the middle and use baker’s twine to tie on a tag – easy breezy. I have a little crush on those evergreen pipe cleaners. You can buy them at any craft store. I love using them to add a little monogrammed personalization to a package. 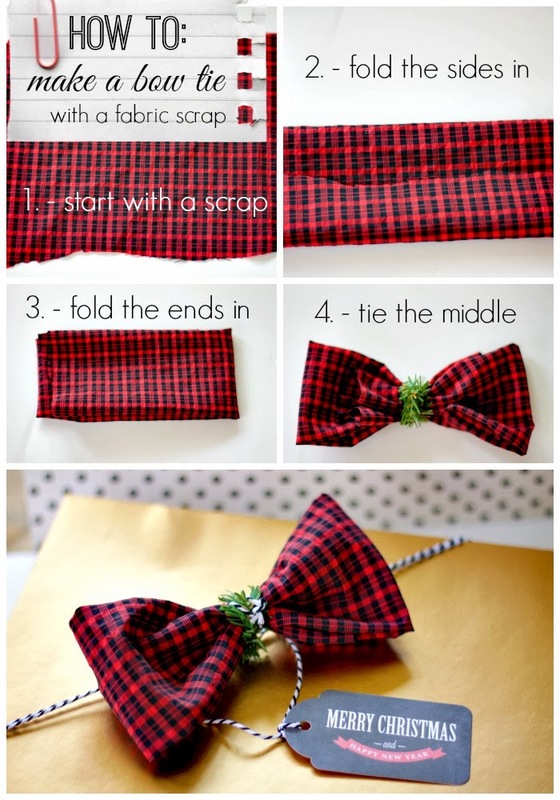 My other favorite way to use old clothes to dress up a package is to make cute little bow ties. These little bow ties are so fun, preppy and sweet that I often skip the wrapping part all-together and just tie them on an unwrapped plain box with some twine. 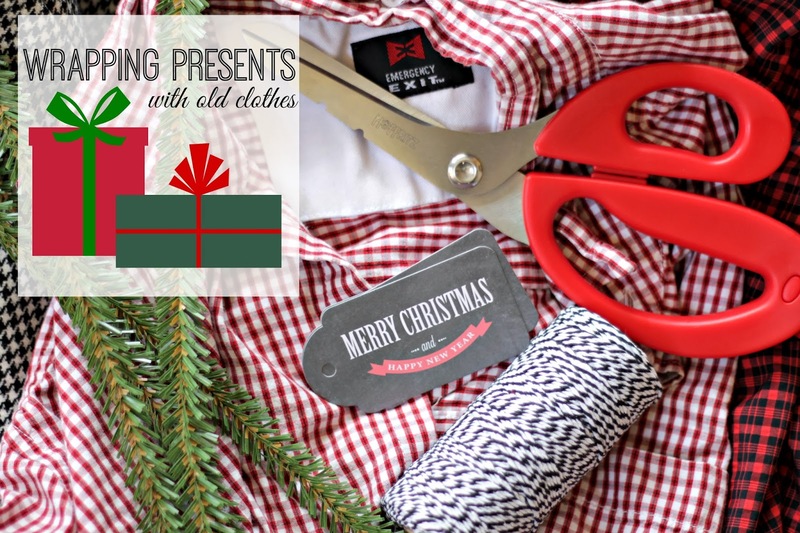 Again with the easy breezy – and PS if you have elementary school aged kids they can whip these bow ties up for you in no time flat – even easier!! I love these bow ties so much! They look great on gift boxes, tied to a bottle of wine or on your kids or pets! 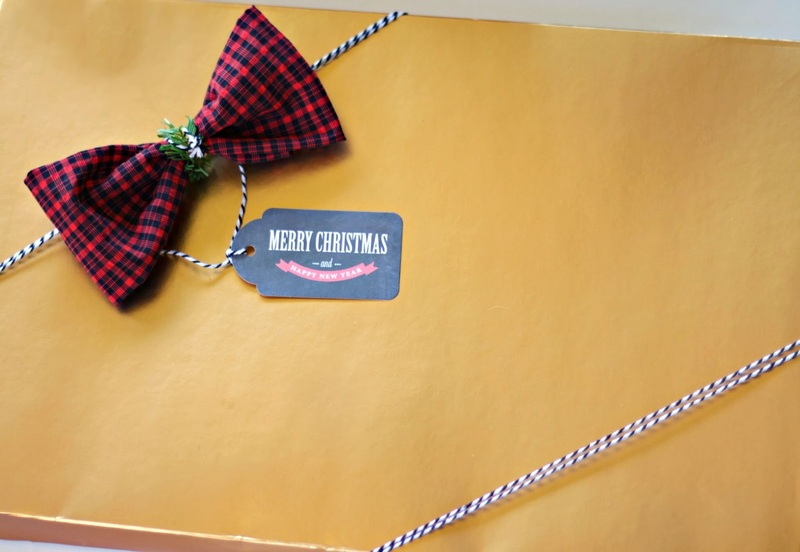 Who needs wrapping paper when you have a metallic gold box and a red plaid bow tie?! Oh and you can find plain white, metallic gold and silver boxes at Big Lots. So, there you go those are my little cheaters tips for making a package look pretty when you’re not a “wrapper”. Wishing you a Happy Easy-Breezy Wrapping Holiday! Thanks for including me in this series! Thanks for coming up with awesome ideas! Love the bow ties! AWESOME idea!! I can’t wait to get started with all my scrap fabrics and clothes- Thanks so much. What great ideas and I love the repurposing! Thanks for sharing this on Throwback Thursday, I’m pinning it to our pinterst board!